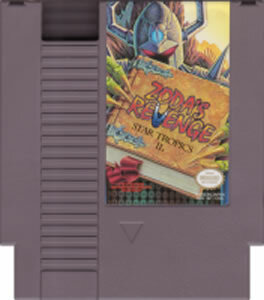 Star Tropics 2 Zoda's Revenge original NES Nintendo Game cartridge only - Cleaned Tested and Guaranteed to Work! We never got this in Europe back in the day, so as a big fan of the first game I was very surprised to learn about it. Now I've finally played it through, and while I still hold the first game as a timeless classic, this one is not far behind at all. Very recommended for fans of the first game! Fast shipping, game works. What more could you ask for? The game functioned and shipping was fast. The gameplay itself is interesting in its own right, but as a fan of the first game I wasn't too happy with this "sequel". It felt like the storyline was not only rushed but written by a bipolar 2 year old. I've made it to the desert level so far and went on a quest to get Cleopatra a late pizza. So it's decent and I plan on finishing it. yay. 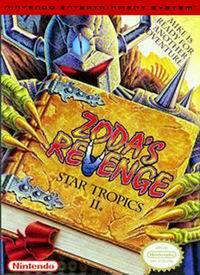 I played Star Tropics but did not know there was a second game, I'm glad I found Zoda's Revenge on your list. I played it through twice and have enjoyed it very much. The cassette was in good condition - no glitches. I played this game in 1994 but it wasn't until '97 that I received my copy for Christmas. I'll say right off that if you're looking for an epic experience like the first game you'll be a little disappointed here. The story is enjoyable but it's told in a much more goofy manner than the original, which can throw you off. There are also pop culture references just like in the first game but they're more common here. The story once again centers on Mike Jones, who's visiting his uncle. Dr. Jay has been trying to decipher a strange book he recently discovered.Not even the alien child Mika, rescued by Mike along with her siblings in the last game, can shed any light on it. Just for the heck of it, Mike takes a crack at it only to be catapulted millions of years into the past, to the time of cavemen in fact. There, after rescuing some children from a ravenous beast, he discovers a myysterious stone and soon learns that the evil alien Zoda, defeated on Mike's last adventure, may be after it as well as the six others scattered throughout history. Can Mike recover the Tetrads before Zoda does? Only time will tell. He has help this time however, from such istoric figures as Queen Cleopatra of Egypt, Sherlock Holmes and perhaps even the legendary Merlin. Whereas the controls of the original Star Tropics were a bit stiff, here they seemed to overcompensate, which can cause problems when trying to make a jump, especially since you can jump diagonally this time. It can be easy sometimes to do this accidentally and either jump right into an enemy or right into the water. Other than that they're the same controls from the original, right down to selecting special items on the pause screne. Audio wise this is another mixed bag. The music's good, don't get me wrong. But it doesn't quite live up to the amazing tunes found in the first game. I will say in the music's defense, however, that it usually fits where it's used, from Egypt to Sherlock Holmes' England to the Wild West town. There are even remixes of the original Star Tropics town and dungeon themes late in the game. 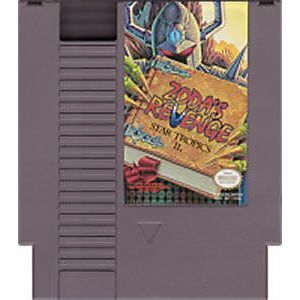 The sound effects are reasonable NES fare, with altered versions of the enemy attack and die sounds from the first game. The sound for when Mike takes damage is a much more painful sound than in the original, sounding almost like he's receiving a solid kick to the arse. As with the original Star Tropics my only complaint is the critical health sound which, like in the original game, plays anytime Mike jumps or uses his weapon. Unfortunately it's a much more annoying sound effect than the last game, being a loud beeping instead of a small squeak. Overall this is a worthy sequel to the original. The goofy humor can be a bit off-putting but one can get used to it. And yes, it also features the famous lines "Wow, you've done it!" upon completing a dungeon and "Now saving your data. Refrain from turning off power or resetting."